NASA Kennedy Space Center’s historic Launch Complex 39A, the site from which numerous Apollo and space shuttle missions began, is beginning a new mission as a commercial launch site. NASA signed a property agreement with Space Exploration Technologies Corporation (SpaceX) of Hawthorne, Calif., on Monday for use and occupancy of the seaside complex along Florida’s central east coast. It will serve as a platform for SpaceX to support their commercial launch activities. Under a 20-year agreement, SpaceX will operate and maintain the facility at its own expense. The reuse of pad 39A is part of NASA’s work to transform the Kennedy Space Center into a 21st century launch complex capable of supporting both government and commercial users. 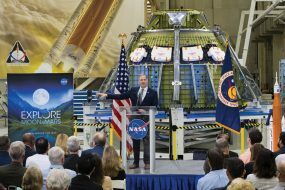 At the same time, NASA and Lockheed Martin are assembling the agency’s first Orion spacecraft in the Operations and Checkout building while preparing Kennedy’s infrastructure for the Space Launch System rocket, which will lift off from the center’s Launch Complex 39B and send American astronauts into deep space, including to an asteroid and eventually Mars. Launch Complex 39A originally was designed to support NASA’s Apollo Program and later modified to support the Space Shuttle Program. Because of the transition from the shuttle program to NASA’s Space Launch System and Orion programs, the agency does not have a need for the complex to support future missions. Pad 39A was first used to launch Apollo 4 on Nov. 9, 1967; it is the site where Apollo 11 lifted off from on the first manned moon landing in 1969; and the pad was last used for space shuttle Atlantis’ launch to the International Space Station on July 11, 2011 for the STS-135 mission, the final shuttle flight. This agreement with SpaceX ensures the pad will be used for the purpose it was built — launching spacecraft.